This is a book that should interest designers who create infographics. The examples provide some nice ideas on unusual ways to present data, particularly on reinventing how table and chart graphics can look. I saw some infographics that are presented in newspaper formats as well. It's a much better collection than the newspaper design books since it focuses on just infographics. Visual storytelling uses graphic design, infographics, illustration, and photography to convey information in the most elegant, entertaining, and informative way. Today, the creative scope of existing visual storytelling techniques is being expanded to meet the formidable challenge of extracting valuable news, surprising findings, and relevant stories from a daily flood of data head on. 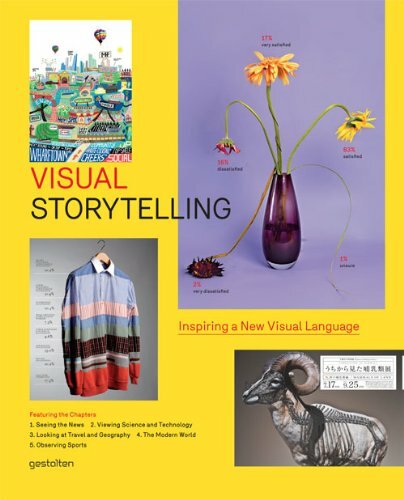 Visual Storytelling is the first book to focus solely on contemporary and experimental manifestations of visual forms that can be classified as such. The rich selection of cutting-edge examples featured here is put into context with text features by Andrew Losowsky and interviews with experts including the New York Times, Francesco Franchi, and Golden Section Graphics.